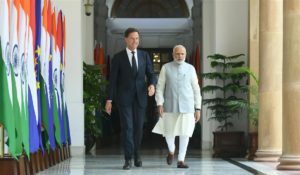 Visiting PM Rutte with Prime Minister Narendra Modi on 24 May 2018 in New Delhi. Dutch innovations and technologies for managing India’s water projects are being considered, according to officials at the Indo-Dutch Ganga Forum. The forum heard presentation on themes such as “Dutch Approach to Partnership in Public Utilities in India” and “Innovative Dutch Solutions for Urban Water Challenges” as well as Techniques like Dutch triple-helix model which were contemplated for Barapullah drain project in Delhi. The forum was inaugurated by visiting Prime Minister of Netherlands, Mark Rutte, who appreciated the efforts being made under Namami Gange programme and acknowledged the vastness of the task at hand. The forum takes forward a Memorandum of Understanding (MoU) signed between the Ministry of Water Resources, River Development and Ganga Rejuvenation and the Ministry of Infrastructure & Environment of the Netherlands in June last year. Addressing the gathering, Rutte said that local governments, the financial sector and the private sector as well as communities will need to join hands with the Indian and the Netherlands governments. He also advocated waste-to-wealth approach to encourage sustainability of projects. His Minister of Water and Infrastructure, Cora van Nieuwenhuizen, also advocated trash-to-cash approach. She expressed the Netherlands government’s keenness to work closely with National Mission for Clean Ganga (NMCG). 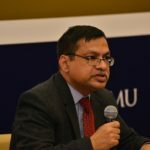 NMCG Director General, Rajiv Ranjan Mishra, gave an overview of the Namami Gange programme, adding that work is being done expeditiously to achieve the herculean task of Ganga cleaning. He added that more innovations are being brought-in to have more efficiency and transparency and also to keep in mind life cycle costs. The inauguration of the Indo-Dutch Ganga Forum was followed by a technical session on “Innovative Financing Models for Indo-Dutch PPP Projects” during which a detailed discussion on Hybrid Annuity based PPP mode took place. NMCG shared with the Dutch delegates the efforts made by NMCG to start two projects under Hybrid Annuity mode in Varanasi and Haridwar which was appreciated by Netherlands government. NMCG expressed its willingness to adopt proven international experience and technologies in waste water treatment sector. 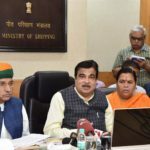 Tagged with: National Mission for Clean Ganga.